Finding Florence turned out to be a little harder than I thought. But after two busses, two trains, two planes, one shuttle and 76 hours of travel, I made it to the most magical place on earth. Florence doesn't just look like a fairytale, it feels like one too. Between the bustling bridges, quite cobblestone backstreets and miles of mustard colored buildings, it is quite literally my dream city. Chronicled below are my first adventures, initial impressions and favorite finds after five days in Florence. The university I'm attending in Florence, Accademia Italiana, doesn't sound real. And it's not just the overly-obvious name. AI is a four-hundred-student-strong fashion, design, and architecture school nestled along the Arno. It boasts a 50% Italian student population, surprisingly central location, and a rooftop that will make you weep. 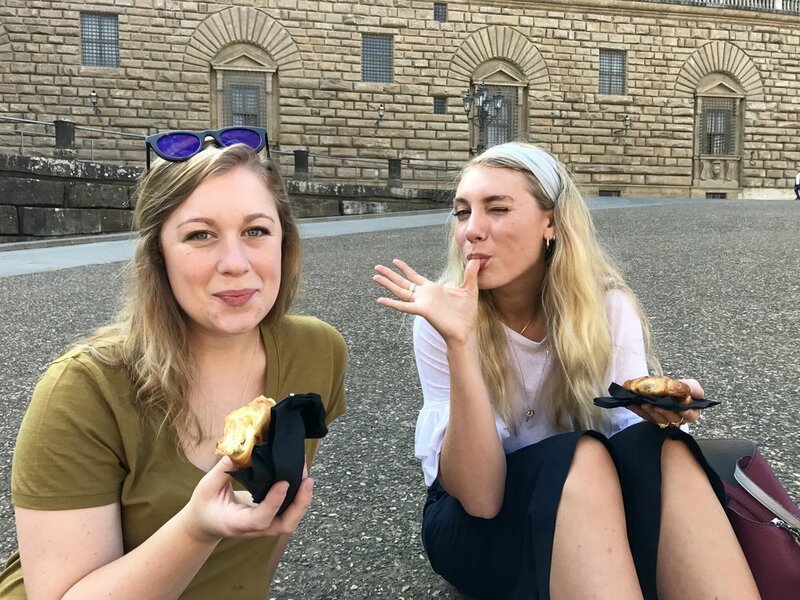 Day one orientation also included eating a bagel and a burning hot Americano (surprise) in the Palazzo Pitti, served, of course, by our resident, bearded, Italian baristas. Piazzale Michelangelo is the first thing that pops up when you google "Florence lookouts". Naturally, we didn't know this as we tred up the infamous steps to see the bronze David. Very worth it. Also filled with sweaty men trying to sell you "bottled" water for 3 eruo. The real magic happens when you get to the churches. 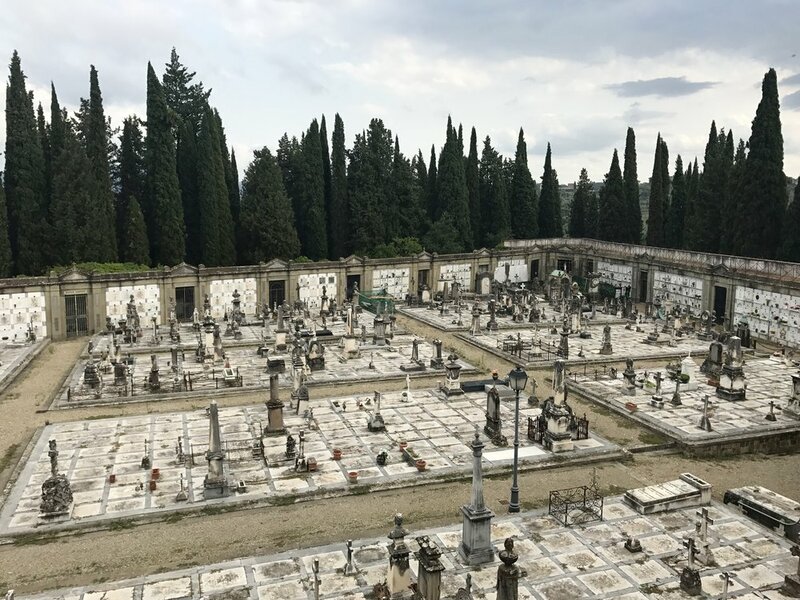 Honestly thank goodness we felt the need to punish our travel-weakened calves just a little longer and explore further up the hillside because at the top you are rewarded the most mystical structure of San Miniato al Monte. It is totally silent besides the crunching of heels on gravel and only a few gentle tourists with their iPhones mill around the courtyard. The graveyard is empty, still, totally heartbreaking and so worth 20 minutes of your day. Villa Bardini is another accidental gem nestled in the hills surrounding Florence. Only about a half mile from our apartment, this pink palace is little known, but extraordinary well outfitted with modern art, avant-garde fashion and a variety of traveling exhibitions. It also has some semi-famous gardens and a patio that looks like instagram threw up. This is a separate section situation. Italian food is famous all over the world thanks to Olive Garden (love you), but Italian food in Italy is a whole different ball game. Football pun intended. First off, everything is fresh. I stumbled upon a lemon tree just randomly growing lemons on the street and actually teared up- that's how fresh the food is. There is a whole different culture surrounding mealtimes as well. Dinner is three hours, no exceptions, and wine is it's own course. Needless to say, this particular adjustment isn't the worst. Florence is all I ever imagined and more. I have already learned so much; like there is a bed size smaller than twin, (who knew! ), how to wash you're hands at an angle because the sink is too close to the wall, how to fall asleep to the accordion version of Despacito drifting through the window and that the Mediterranean diet is really just pasta and gelato. Can't wait for next weeks lesson. Stay tuned.